Welcome to the holiday season. Yes it's time for the bands we know and love to release their versions of classic Christmas songs and maybe some original Christmas songs as well. Let me welcome you to the new five track EP from For King & Country. The last we heard of the band was their 2012 release Cave, which gained many great reviews. Now the band are here with their Christmas songs. Read More Welcome to the holiday season. Yes it's time for the bands we know and love to release their versions of classic Christmas songs and maybe some original Christmas songs as well. The album is a joy to listen to from the moment the synth led Angels We Have Heard On High begins. There is a brilliant haunting drama to this song that you sometimes don't hear on other versions. The moment this song came out of the speaker I just knew I would really enjoy this EP. Baby Boy is an epic anthemic sounding track. As you can tell from the title the song is all about Jesus being born. Actually the closing track of the EP is also a live version of this song. The live version sounds very different to the album version, which I was surprised at, yet both songs have this anthemic power to them. This Christmas EP is very charming and title track Into The Silent Night has the characteristics of a warming, happy, Christmas delight that once you listen to you will finish the EP with a big Christmas smile on your face. The song Little Drummer Boy has never really been a favorite of mine. 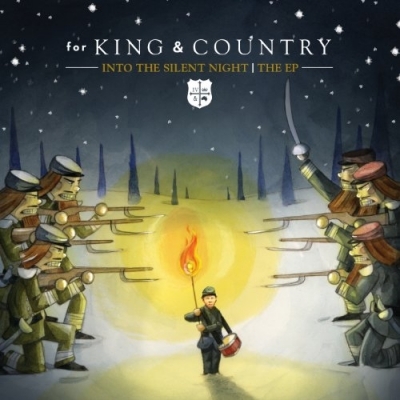 Yet For King & Country have produced a whole new style for the song. Firstly, the music has a darker edge to it. The guitars have a distorted drive that I wasn't expecting. The song still isn't one of my favorites but this way of doing it has made me like it a little bit more. This EP is not filled with the obvious Christmas songs, but is a great alternative Christmas album. The versions of the song are very much the band's own take on things, and this is a major plus. This is worth getting if you're a fan of the band or fancy listening to the band doing Christmas their way.